At the time of this writing, the 2013 World Conference of Community of Christ is just 5 ½ months away. Of course that will be 5 ½ months of winter, but lets not think about that just yet, okay? Still, time passes quickly, something I am becoming increasingly aware of the older I get. Like previous conference, the 2013 event will be held at the Church's international headquarters in Independence, Missouri. Before we know it, conference time will be here. Those who are willing and able to attend are already putting their names on the CEM delegate list. If you are a member of Community of Christ and would like to represent Canada East Mission at the 2013 World Conference, you should let Cheryl Campbell know if you have not already done so. There are still some vacancies available, but the sooner you reserve your place, the better. In preparation for the conference, the First Presidency has asked each of us to take the time to make some personal preparation by spending time in study and prayer using Peter Judd’s new book, Christ’s Mission is Our Mission. This compact but thorough resource calls us to explore deeply the meaning and ministry of Luke 4:16-30. To help accomplish this, the book is divided into six chapters, each dwelling on one aspect of the scripture cited above. Each chapter is further divided by a series of questions for reflection. These are conveniently embedded into the text at regular intervals, with plenty of material for at least a week spent on each chapter. Following this method, we might expect to make this resource a daily companion for approximately six weeks. It will be time well spent, especially in those coming (shiver) winter months. 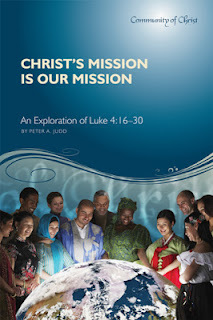 Christ's Mission is Our Mission is available by mail order from Herald House. A supply has also been ordered to be available at the CEM office in Guelph for your convenience. Hmm... now, I wonder why that snow shovel is hanging there right by the garage door!